“Please sit back and enjoy our concert dedicated to the heroes of America”. These were the words said by Arthur Himmelberger, the Director of Music and the Director of Bands, before conducting his band to play. 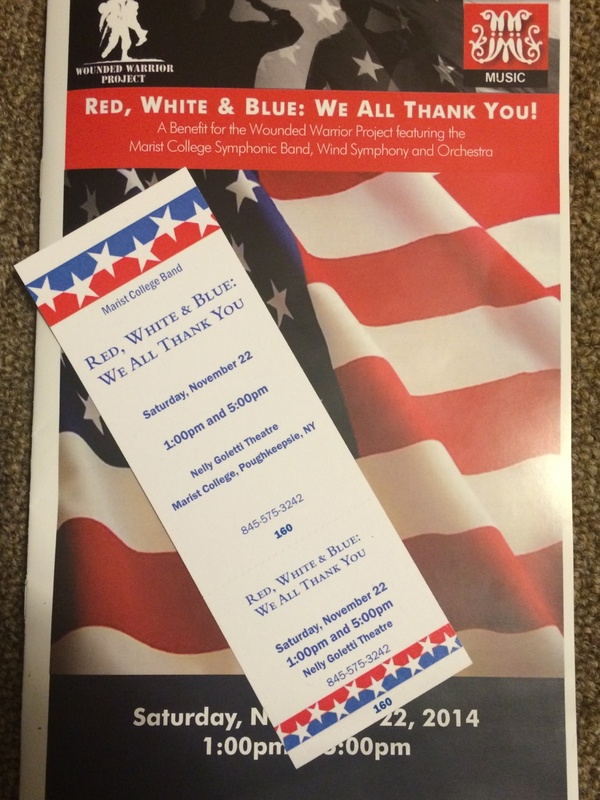 This past Saturday the Marist College Band held an event called “Red, White & Blue: We All Thank You” to benefit the Wounded Warrior Project in the Nelly Goletti Theatre in the Marist College Student Center. It consisted of the Marist College Symphonic Band, Wind Symphony, and Orchestra tickets were five dollars for students and senior citizens, and ten dollars for the general public. There were two concerts held on Saturday with the first being at one o’clock and the second at five. Before the concert there was a video playing showing the heroes that received the Medal of Honor and telling their story as well as raffle tickets with the winners announced in between the two concerts. The Marist Band getting ready to perform for the Wounded Warrior Project. A portion of both the ticket sales as well as the raffle ticket sales were donated to benefit the Wounded Warrior Project. The organization was founded in 2002 and is a veteran service that offers different services, programs and events to aid wounded veterans of military actions after September 11th, 2001. The Warrior Wounded Project serves three main purposes. Those purposes are to raise awareness and enlist the public’s aid for the needs of injured service members, to help injured service members aid and assist each other, and to provide unique, direct programs and services to meet the needs of injured service members. Their vision is “to foster the most successful, well-adjusted generation of wounded service members in our nation’s history” as reported on their website. The organization has five core values which are fun, integrity, loyalty, innovation, and service. By 2017 the Wounded Warrior project plans to have helped 100,000 families from the donations received. “We have to take it upon ourselves, the public sector, to reach and help out these wonderful people who risked their lives to help us” said Himmelberger. “One story that I read about that really sticks out to me is that there was a mother who served living in a car with her baby in North Dakota. Wounded Warrior found her and granted her $11,000 of the money she was supposed to receive but never did and she said ‘Now I can get a hotel room to sleep in, but first I am going to get a warm meal for my baby’. That story really makes me love what the Wounded Warrior Project does, they found this woman and changed her life” Himmelberger said. It is a great cause and the band had a little extra emotion knowing what they were playing for. “I think that with any concert there is a certain level of joy that reaches you as a musician; not matter what you play you’re always reaching an audience, and that in itself is a fantastic feeling. But this concert was such a pleasure, not only because our ticket proceeds are going to the wounded warrior project, but because we touched the hearts of the people in the audience that may have served or have a loved one currently serving” said senior clarinet player Rachael Black. The people in the audience were definitely touched. Throughout the performance at any point you could see somebody getting emotional. 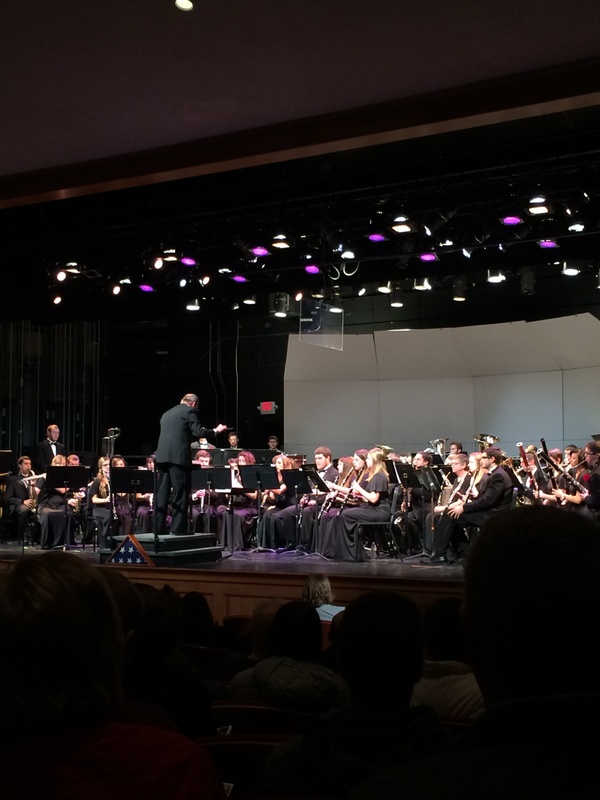 During one of the song’s Himmelberger shouted out the branches of the United States Armed Forces and anybody in the audience who served for that branch or had a close loved one currently serving would stand up as the band played in their honor. “I served in the army so the Wounded Warrior Project is something special to me, but I also wanted to give recognition to the people in the audience who have fought for our country” said Himmelberger. “They came to see us perform and I wanted to show them that we respect what they did and put them in the limelight” he added. The concert provided the band with a great feeling knowing that they are helping, but audience members and people who served also love what they did. “My father served as a marine, and my brother followed in his footsteps so I am here on behalf of both of them. I think it is really great that the band does this. I feel like the troops do not always get the recognition they deserve but today was great and the band did a fantastic job” said Amy DeYoung, a Hyde Park resident. Roy Durocher Jr. was a cavalry scout in the Army. The cavalry scout is responsible for being the eyes and ears of the commander during battle. They engage the enemy in the field track and report their activity and direct the employment of weapon systems to their locations as explained on goarmy.com. Roy was shot overseas and loves when people do things to benefit the wounded warrior project. “I was lucky that when I was shot that it was not very severe, but people that I knew have been horribly wounded and killed” said Durocher. “It is terrible that these families have their lives changed by losing a loved one or having one injured physically or mentally, but the Wounded Warrior Project is great and I love everything that they do. Hearing about the Marist Band hosting a concert to benefit the organization makes me very happy. It’s always great to hear about people giving us support it makes it feel like I did something that people really appreciate and that is an amazing feeling”. This also is not the first time that the band has done this. Every fall they put together a concert and donate to the project. It is something close to Arthur Himmelberger as he and his daughter have both served in the Army so putting together this concert and donating every year is special. Ticket and Program from Saturday’s concert. Although the band is very proud to be a part of this and see’s the importance in it, the preparation is still the same. “The Marist Band is a very dedicated group of people and we rehearse quite a lot for every show we play. Though the amount of time spent rehearsing for this concert was just as much as we usually rehearse for a concert, a lot of hard work went into perfecting these songs to be the best they can be” said Black. The Marist Band has six recitals and concerts left this semester all during December for anybody that would like to show support. They do a lot for the community and put in a lot of hard-work to deliver a satisfactory show. This entry was posted in Arts, Culture and Entertainment, On Campus and tagged #Marist, Band, Donation, Warrior. Bookmark the permalink.